If you came to this page directly, you might wish to read a page with an introduction to this section first or start with Jerusalem - The Walls. 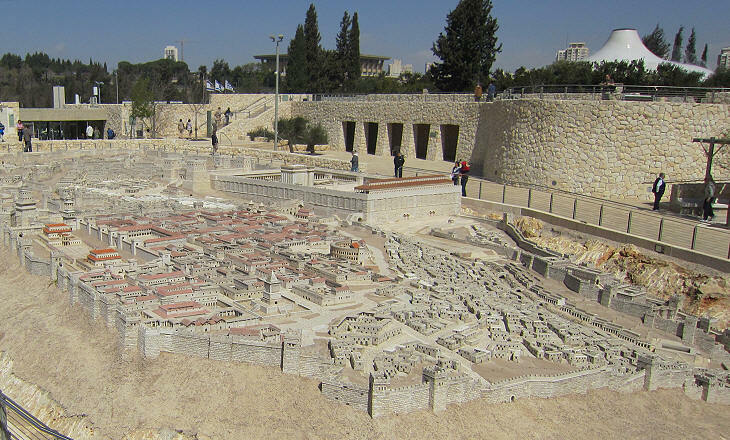 In 1962-66 archaeologist Michael Avi-Yonah built a model of Jerusalem prior to its almost total destruction in the course of the First Jewish War which ended with the seizure of the Temple by Titus, Emperor Vespasian's son. The event was eventually celebrated by a triumphal arch in the Roman Forum. 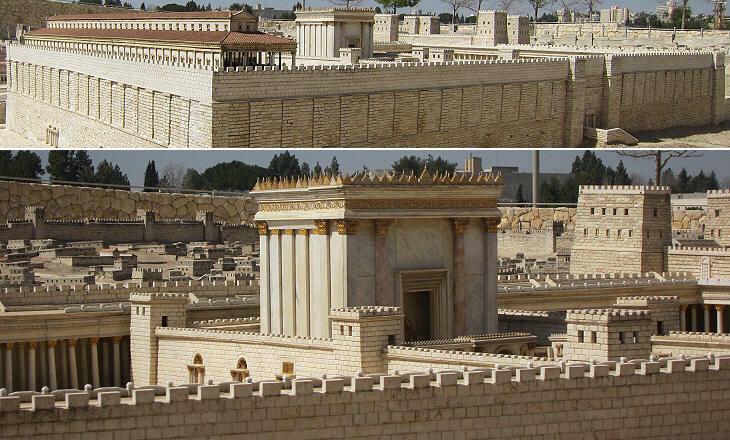 The model was built when Old Jerusalem was part of Jordan and Jewish archaeologists had not access to it. It was initially developed as embellishment for a hotel. It was moved to the Israeli Museum in 2006. The model includes a large theatre resembling Teatro di Marcello, a facility typical of the Greek/Roman world. 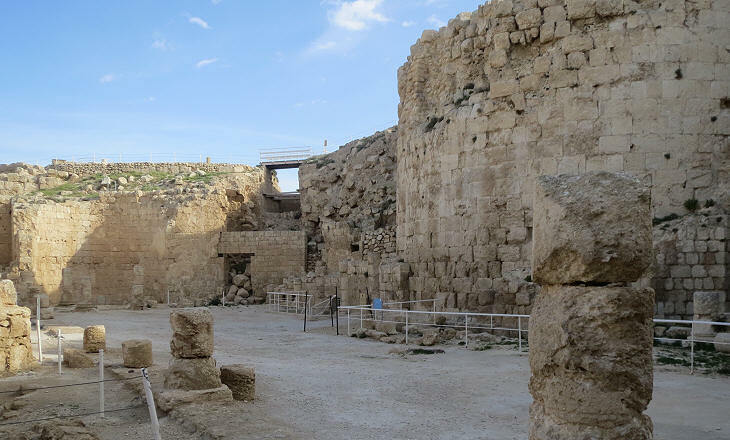 The Second Temple was situated at the centre of a large rectangular portico made up of painted limestone columns which was built by King Herod the Great. Access to the central section of the portico and to the Temple was reserved to Jews. Overall the size and shape of the complex were similar to the temenos (sacred area) of the Temple to Jupiter in Damascus. In the model the portico surrounding the Temple is situated on higher ground than the rest of the city. As a matter of fact Mount Moriah, the hill which was levelled to build the portico is at a level lower than the rest of the city. 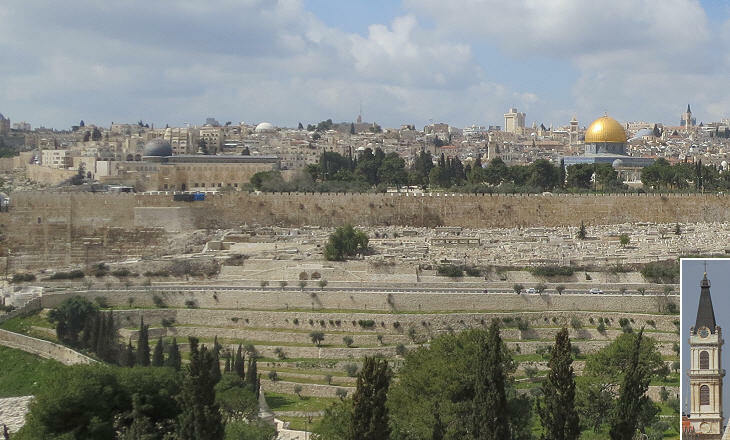 Overall Old Jerusalem slopes down from its north-western corner, marked by the bell tower of the Franciscan church, to its south-eastern corner, the terrace where the Temple stood. 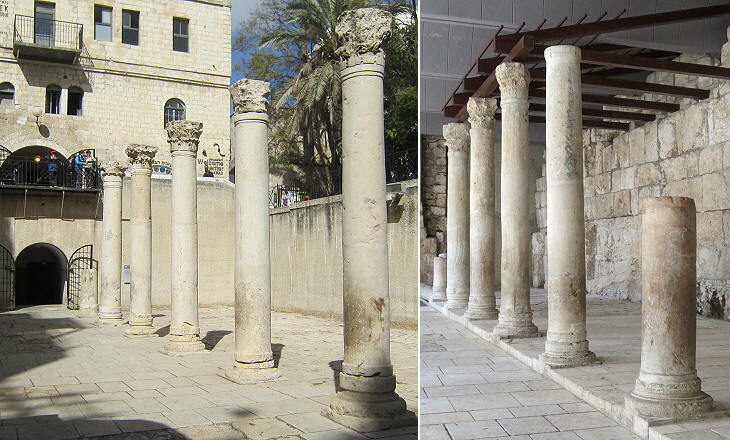 The large portico was likely used as a marketplace, as per the episode of the Cleansing of the Temple (John 2 13-16). The episode refers to moneychangers and sellers of doves; these two activities were related to offerings and sacrifices made at the Temple, but probably other trades went on at the portico. Jerusalem in 66 AD included some neighbourhoods to its south which are outside the XVIth century Ottoman walls. 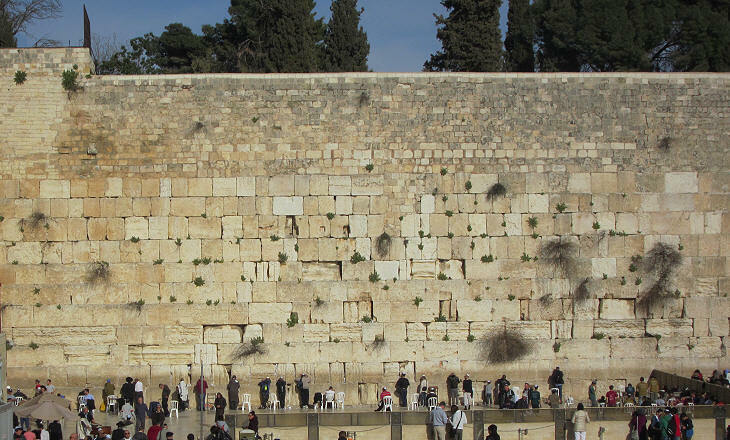 Jerusalem became the capital of the Kingdom of Israel after it was conquered by King David in ca 1000 BC. 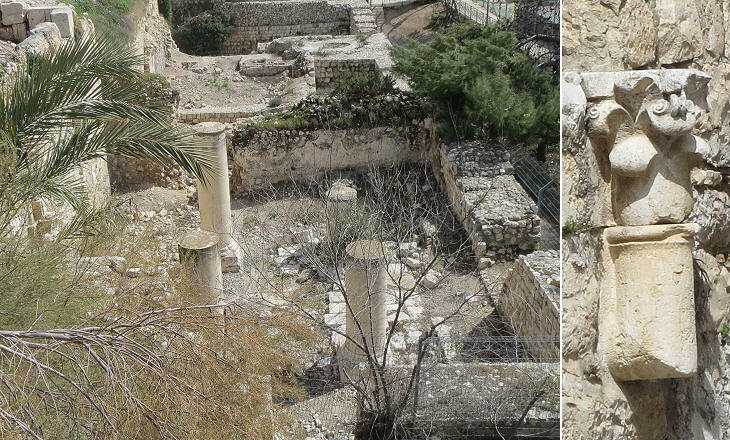 Recent excavations indicate that David's Jerusalem was located south of the city on a hill opposite the terrace of the Temple. The First Jewish War was in part a civil war too. Some Jews supported the Romans and in addition the leaders of the revolt fought among themselves, even inside Jerusalem. The Temple and most of the town were destroyed. This event and other national tragedies are mourned every year with a day's fast. 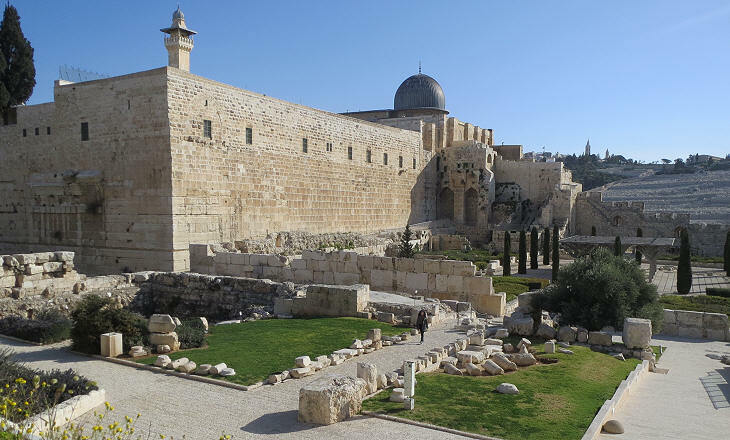 Jews do not access the terrace because it is regarded as a deconsecrated area after the destruction of the Temple. They gather to pray at a section of the wall supporting the terrace. Its lower part is still made up by the ancient stones, whereas the upper one is the result of later repairs. Jewish affairs were going from bad to worse. The work of construction was continuing in Jerusalem, in spite of the violent opposition of Zealot groups. A certain number of errors had been committed. (..) The Tenth Legion Fretensis has a wild boar for its emblem; when its standard was placed at the city gates, as is the custom, the populace, unused to painted or sculptured images (..), mistook that symbol for a swine, the meat of which is forbidden them, and read into that insignificant affair an affront to the customs of Israel.(..) Governor Tineus Rufus decided to extend to the Jewish practice of circumcision the same severe penalties of the law which I had recently promulgated against castration (and which was aimed especially at cruelties perpetrated upon young slaves for the sake of exorbitant gain or debauch). (..) No people but Israel has the arrogance to confine truth within the narrow limits of a single conception of the divine. (..) I was only the more anxious to make Jerusalem a city like the others, where several races and several beliefs could live in peace; but I was wrong to forget that in any combat between fanaticism and common sense the latter has rarely the upper hand. Marguerite Yourcenar - Memoirs of Hadrian - Translation by Grace Frick in collaboration with the author - Farrar, Strauss and Giroux 1954 - Reprinted in Penguin Classics 2000. 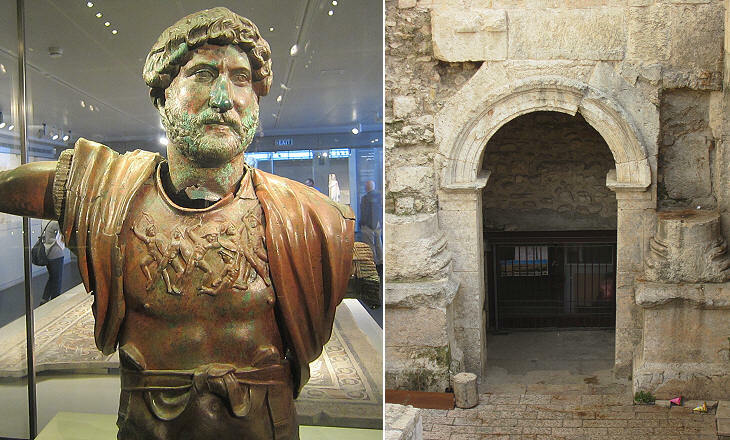 You may wish to learn more about Marguerite Yourcenar and her book on Emperor Hadrian. The French Catholics are building a church on this spot, and with their usual veneration for historical relics, are incorporating into the new such scraps of ancient walls as they have found there. 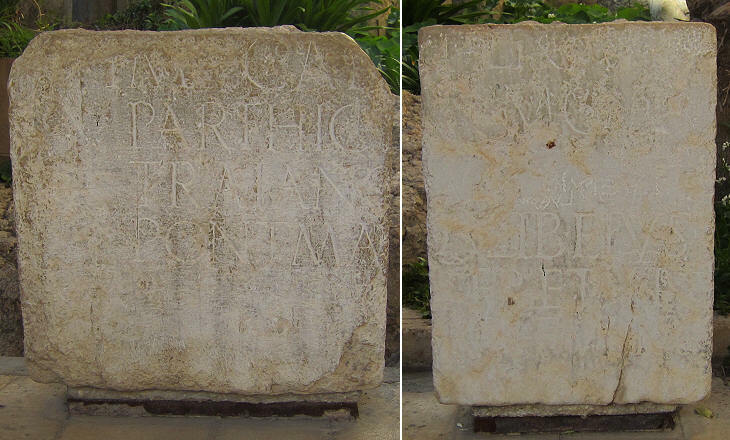 At the end of the Second Jewish War (132-35) Emperor Hadrian proscribed the Jews from Aelia Capitolina, the town he had founded on the ruins of Jerusalem and which was named after the emperor's first name (Aelius) and the Capitoline Hill, a symbol of Rome. Today it is very difficult to find open references to Aelia Capitolina. For the Jews it is a sort of case of "repressed memory", a condition where a memory has been blocked by an individual due to the high level of stress contained in that memory. 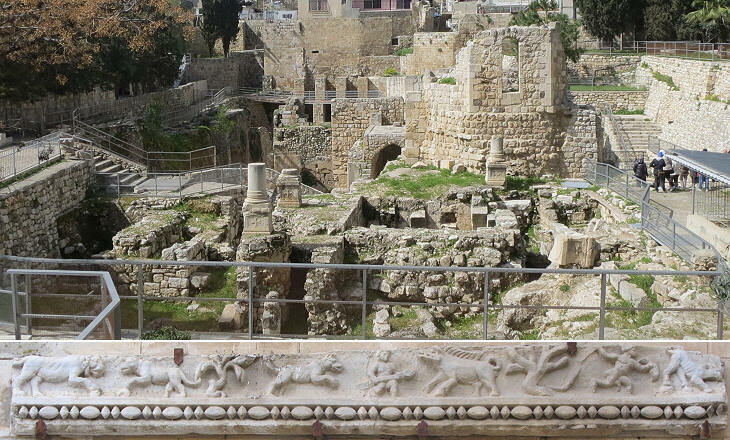 The Museum of the History of Jerusalem which is housed in the Citadel does not even mention Aelia Capitolina. Aelia Capitolina is a case of "repressed memory" for the Christians too. It was built above the ruins of Jesus' Jerusalem and its remaining monuments indicate that the current, mainly Mameluke, town is some 10 feet above Aelia. The pilgrims who come from all over the world and who sometimes almost re-enact the sufferances of Jesus by carrying heavy crosses and wearing crowns of thorns, prefer not to be aware of the existence of Aelia under the stones of Via Dolorosa. 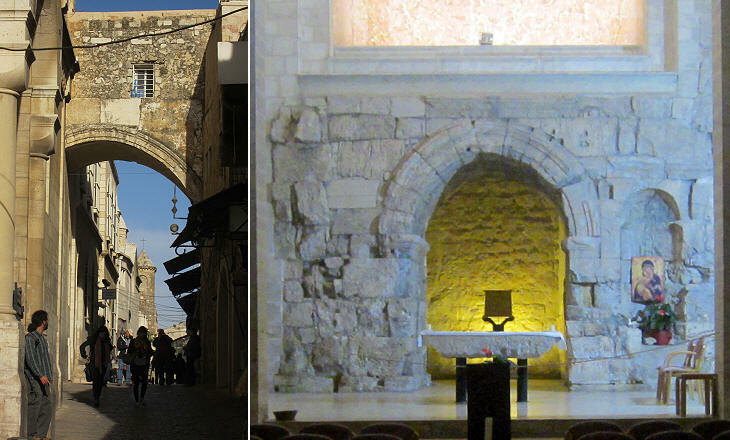 By and large most of the evidence of Aelia is due to findings which occurred during the construction or enlargement of churches and convents along Via Dolorosa in the north-eastern part of the town. These are now dispersed in the courtyards of several mainly Catholic establishments. Hence we proceeded to the supposed site of the pool of Bethesda which is close by the gate of Our Lady Mary. The water now exists no more, but its site is a long valley about 60 feet in depth 300 in length and 100 in breadth. It is overgrown with trees and shrubs and is now used as a common sewer by the inhabitants of the houses built on its brink. Baths are a typical monumental building one expects to find in a Roman town. 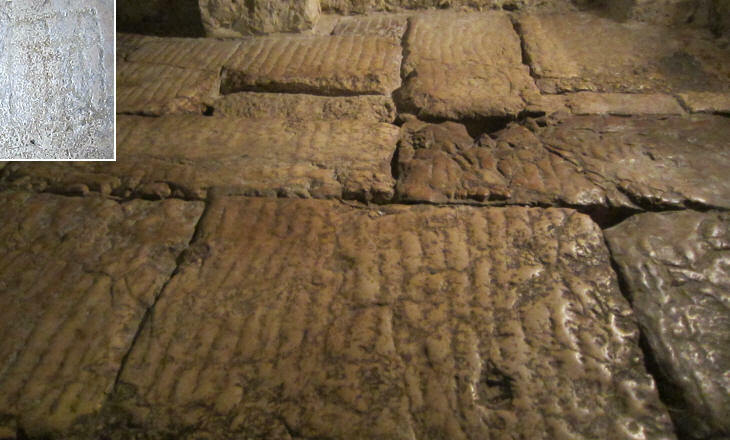 They were probably located not far from a double cistern near Lion Gate, the eastern gate of Jerusalem. Aelia was supplied with water by a long Roman aqueduct. The presence of a Temple to Aesculapius, god of medicine, near a cistern is due to the importance of bathing and in general of water in treating patients. You may wish to visit the Asklepion of Pergamum to better understand the state-of-the-art medicine at the time of Hadrian. Tabula Peutingeriana (it opens in a separate page), a Vth century map added the words antea dicta Jerusalem (once known as Jerusalem) to Aelia Capitolina (7 in the map), but eventually the ancient name replaced that given by Hadrian. In the mosaic of Madaba Jerusalem was referred to as Holy City. In this map the religious centre of the town was no longer at the ancient Temple (where Hadrian built a Temple to Jupiter), but it had moved to the basilica built on the site of the Holy Sepulchre. After the Old City was annexed by the Kingdom of (Trans)Jordan in 1950, the Jewish Quarter which stood in the southern part of the city was largely burnt and most of its buildings were pulled down. Excavations carried out to rebuild the quarter led to unearthing a section of Cardo Maximus, the main north-south street of the ancient town. 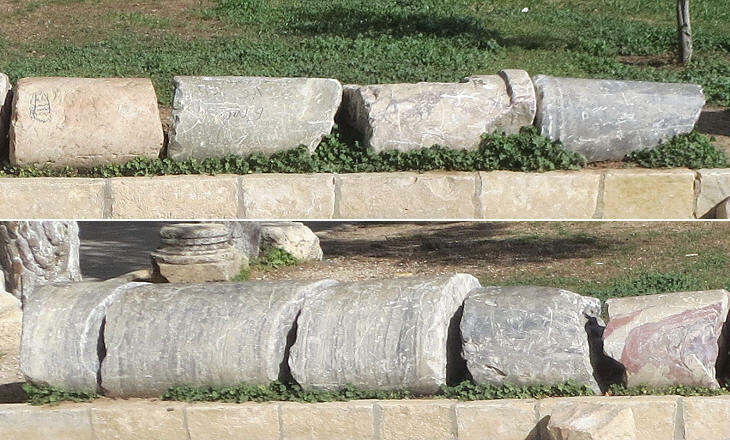 Archaeologists indicate that the columns belong to a Byzantine restoration of the street. 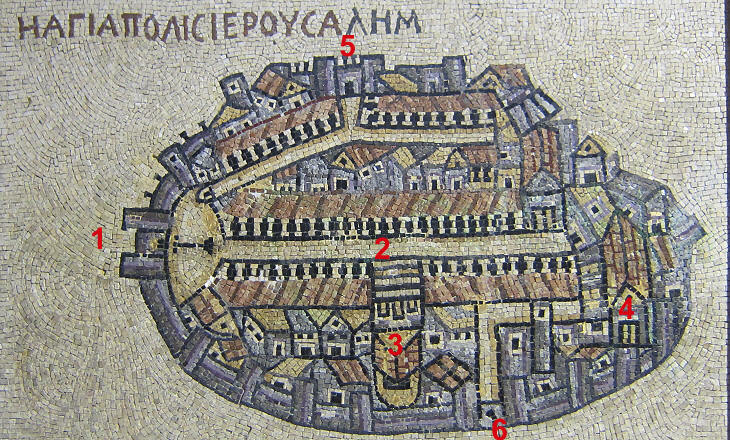 Other excavations carried out in the Jewish Quarter unearthed the foundations of Basilica Nea, a church founded by Emperor Justinian in 540 and shown in the map of Madaba. The accuracy of the map is demonstrated by the column shown near Damascus Gate. That column has disappeared, but for centuries another column stood in that same place to indicate the junction of the two cardi and the gate was also known as the Gate of the Column. 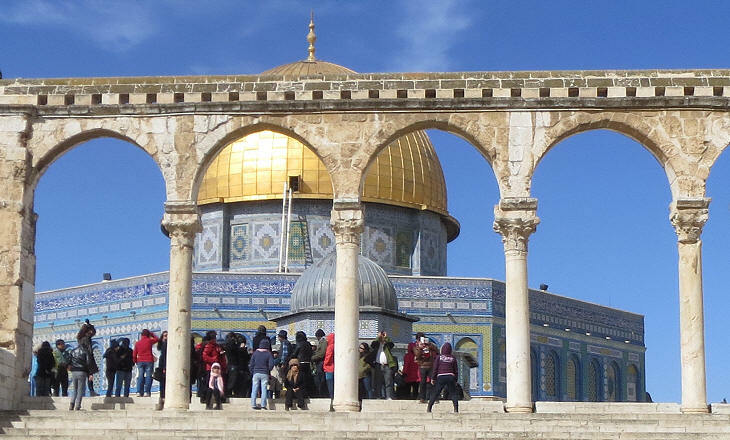 In order to gain a real understanding of the wealth of Aelia Capitolina one has to visit Haram ash-Sharif, the Arabic name for the terrace of the Temple, and its Muslim monuments which, similar to many churches of Rome, were built utilizing ancient columns and capitals. There is a somewhat extraordinary high standard of execution in the monuments which were built throughout the Roman Empire. This was due to a "division of labour" by which some locations such as Aphrodisias provided almost the whole empire with marble capitals and reliefs. The Byzantine capital in the foreground most likely came from Constantinople. The image used as background for this page shows a Corinthian capital. 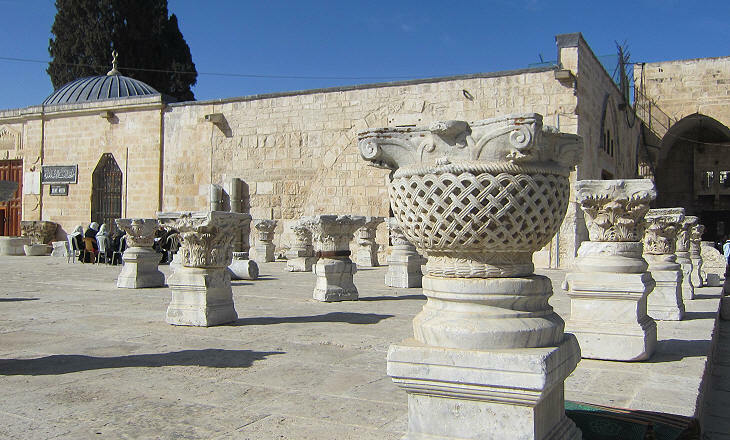 Twain was wrong in saying that the columns belonged to the Temple built by King Herod. 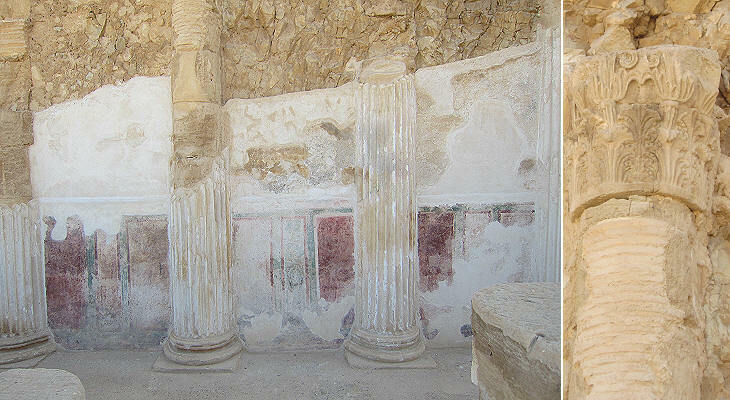 The columns of the Temple were made up of painted limestone similar to what can be seen at the king's palaces of Masada and Herodion (they open in a separate page). The "division of labour" was applied to columns too. The use of coloured columns was very fashionable at Hadrian's time. Pink and grey granite columns came from Egypt, as well as a very precious type of porphyry. Cipollino was quarried in the Greek island of Euboea. Simitthus, in today's Tunisia, provided the whole empire with yellow and red columns.